NEW YORK (CNN) -- The governors of Massachusetts and New Hampshire declared states of emergency Friday after high winds, rain and snow swept through the Northeast, leaving at least a million homes and businesses without power. 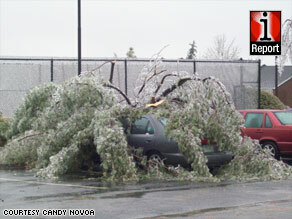 iReporter Candy Novoa says she woke up Friday to find a tree branch lying across her neighbor's car. The National Weather Service said sleet and snow, along with more than half an inch of ice that accumulated on roads in some areas, had made driving treacherous. In Massachusetts, work crews struggled to clear the debris because the powerful storm left roads and bridges covered in ice. Gov. Deval Patrick told WCVB-TV in Boston it would be optimistic to think power would be restored by Monday. Patrick mobilized 500 National Guardsmen to help clear roads, WCVB-TV reported. Utility company National Grid reported that nearly 300,000 homes and businesses in Massachusetts were without power. "This is a serious storm," John Maserjian, a spokesman for Central Hudson Gas & Electric in upstate New York, told CNN. "We have contended with worse storms in past years, but this is among the worst." In New Hampshire, more than 300,000 residents had no electricity, CNN affiliate WMUR in Manchester said, citing reports from four of the state's utility companies. The station reported that fire departments across the state were scrambling to respond to reports of transformer explosions, downed power lines and utility poles, as well as burning and felled trees. The New Hampshire state fire marshal's office told WMUR a 49-year-old man died during the ice storm. WMUR reported a 49-year-old man died from carbon monoxide poisoning while trying to heat his camper using a generator. Gov. John Lynch declared a state of emergency and issued a statement, saying, "With rain expected to continue and temperatures expected to drop as the day progresses it is important that the state has all its resources available to manage this situation." Amtrak train service between Albany, New York, and New York City was suspended Friday morning, as was service between Portland, Maine, and Boston, Massachusetts. Ice and wind caused tree limbs to clutter the tracks and work crews could not clear them. Amtrak said it hoped to have service restored by Friday evening rush hour. The National Weather Service issued a winter storm warning Friday morning, saying that increasing winds and significant amounts of snow and sleet were expected. The deteriorating conditions could result in further damage to trees and power lines, the weather service said. Central Maine Power had 220,000 homes and businesses without electricity, spokesman John Carroll said Friday afternoon. More than 50,000 Central Hudson Gas & Electric customers in the Hudson River Valley were without power early Friday afternoon, said Denise VanBuren, a spokeswoman for the utility. Mutual aid crews in neighboring areas are spread thin, VanBuren said, so utility officials are requesting help from out-of-state crews, meaning power is not likely to be restored until Sunday or Monday. National Grid in New York reported more than 185,000 customers lost power in 23 counties. The company also had 22,000 customers in New Hampshire and 6,000 in Rhode Island without power. Residents also were having to contend with floods caused by excessive rainfall and blocked storm drains. The power outages raised concerns about the health of senior citizens in Holden, Massachusetts, and Goffstown, New Hampshire. Medical crews in Goffstown evacuated the Villager Nursing Home after the facility lost power. Residents were moved to a nearby middle school, WMUR reported. In Holden, senior citizens requiring oxygen were transported to a local hospital or a makeshift shelter at the town's senior center, according to WCVB. "Stay home if you live in Holden. Don't come to Holden if you work here," Holden Fire Chief Jack Chandler told WCVB. Friday's weather service forecast called for continued snow showers and temperatures below freezing across the Northeast. Snow accumulations of 1 to 3 inches were expected.